Valentine’s Day is tomorrow and if you are like the rest of us that means you’ve probably had the opportunity to make that difficult decision of picking a chocolate from the heart shaped box of uncertainty. We always intend to pick the yummy caramel and usually end up with the gritty coconut - yuck! We don’t want the selection of your Dustless Blasting machine to be difficult for you, so we have made choosing the right machine easier than choosing the right piece of chocolate! Ease of Operation - Fortunately Dustless Blasting machines all use the same process. Match the Model to your Industry - We offer various sizes to accommodate different job types, from small projects to huge industrial-scale work. The larger the machine, the longer the run time and tank fill capability. Trailer Size - We have a model that fits in a standard garage, or a low deck for easy stepping on and off also capable of holding a pallet of material and tools to get you though the work day. 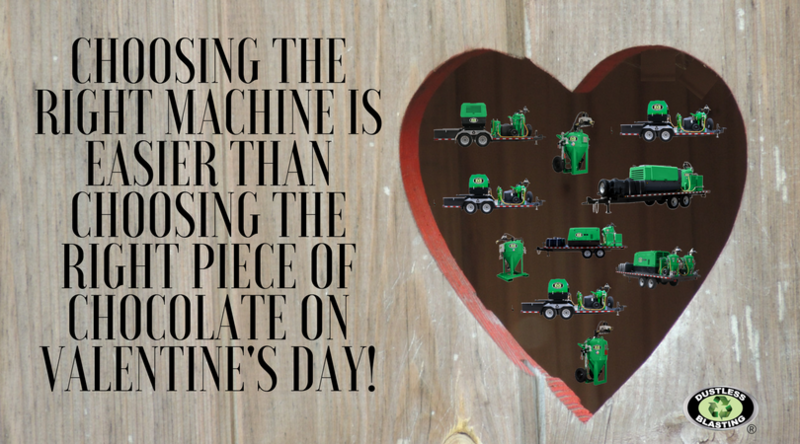 Choosing the right machine will make your job easier, make the project cost-effective and allow for efficient use of time. Its that simple.